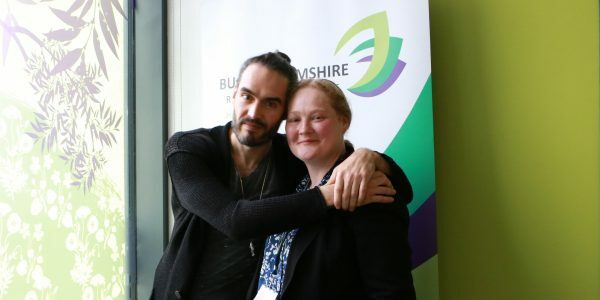 Actor and comedian Russell Brand shared his recovery experience at the launch of Buckinghamshire Recovery College, which is dedicated to supporting people’s mental health. An exciting new development in mental health services has been launched in Buckinghamshire today, 27th January 2017. Actor and comedian Russell Brand joined guests at the launch of Buckinghamshire Recovery College to share his experience of recovery. Buckinghamshire Recovery College is the first college in the county dedicated solely to supporting people’s mental health. Using an empowering and educational approach to mental health recovery, it is run for people who use mental health services by people who have experienced or live with mental ill-health themselves. These lived experience tutors work alongside health professionals to co-produce and co-deliver courses and workshops at a range of venues across Buckinghamshire offering people the knowledge, skills and support to help them best manage their health. It’s an innovative learning environment for people who use mental health services as well as their family and friends, carers and staff. Russell Brand inspired others on their recovery journey and talked about how fundamental mental health care skills, like those taught at the college, can help people with a range of symptoms and illnesses. He said: “I was unable to sit and be at ease with my own feelings. These are the type of skills people need to address. He added: “My personal experience is that it requires the support of a loving community of people who have personal experience of the problem. Celebrating the opening Buckinghamshire Recovery College head Carol Tough said: “Buckinghamshire Recovery College is rooted in a unique empowering approach. “We know people are increasingly seeking support with their mental health and by joining the recovery college they are able to take control of their own recovery as an alternative or alongside the more traditional therapeutic approach. “Courses are co-produced by trained tutors and peer tutors with lived experience, and they’re free to access by people using adult mental health services run by Oxford Health NHS Foundation Trust in Buckinghamshire and held at venues across the county. “Every day we’re able to learn something new from one another because everyone has their own unique experiences, knowledge and understanding; either through their own experiences of mental health, or those of a loved one, or perhaps from their professional experiences of the challenges people face. “That co-production ethos brings a real wealth of understanding and knowledge, and in turn, real benefits to people’s lives because they can find something that’s meaningful to them. They can find what’s right to help them understand how they can better manage their mental wellbeing and practice self-care. The college operates on a hub and spokes model. The hub is based at the Whiteleaf Centre in Aylesbury and courses take place at the centre and venues across the county. Find out more about the Buckinghamshire Recovery College and its courses on its website, or follow the conversation on Facebook @BucksRecoveryCollege or Twitter @Bucks_Recovery.